I think most people can say that they’ve felt the weight of the world on their shoulders at some point or another. The question becomes – How do we deal with that weight? For me, I am fairly good at prioritizing, but I am also fairly good at putting off things that are mentally straining. I am 100% thankful to be able to attend college and get a degree, but I think the fact that I have been in college for 10 years working on a 4 year degree has me a bit on edge. The biggest mental strain on me right now isn’t my senior level classes, or even Comprehensive Exams. My senior level classes are challenging, but are right up my alley. They focus around my passions and future goals, so despite the challenge of the material I am all there. Comprehensive Exams have proven to be challenging as well with a ton of reading, studying, writing, repeat. But again, reading and writing are what I love to do, even when it is difficult. So I work hard and do well. So you wouldn’t think that my biggest challenge is Elementary Spanish. Literally, a freshman college language course. I don’t want to hear how learning Spanish is profitable, or how I will always look back and be glad I took these courses. The problem lies with the fact that no matter how hard I work at it and how much I study, It just doesn’t get easier. The more I learn, the more I forget. Just when I feel like I can wrap my mind around present tense verb endings, we start learning preterits and exceptions with irregular verbs. Just when I think I might skate by with a B in this class, I am staring at the review sheet for my upcoming test on Thursday and I can’t even answer one question confidently. The issue is that I am not naturally good at foreign languages, in fact I almost have a mental aversion to them. The problem is that I just don’t have any driving passion behind learning Spanish. I know it is profitable, but the syntax, spelling and pragmatics (etc) of English are so ingrained in my head that it is hard to re-wire them easily. And it is hard for me to accept that the GPA I worked so hard to attain will be taken away from me, no matter how hard I try to keep it. The only thing I can do now to deal with this weight is to try my best to let it go. In the grand scheme of things, a lower GPA isn’t the end of the world. I am going to be the first person in my family to get a Bachelors Degree. I am going to be able to work in a field I am passionate about because of this future piece of credentials. That is what really matters in the end. 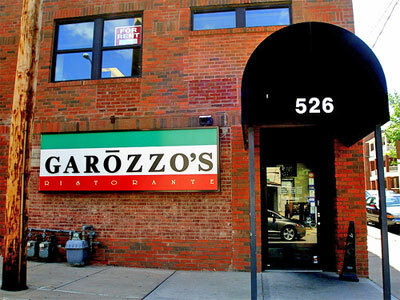 For our third and final venture, I was strongly encouraged to try this Italian restaurant in the Riverside district called Garozzo’s. Not only was it authentically native to Kansas City, but it also had created a signature dish called Chicken Spiedini that has now been copied by several other Italian restaurants within Kansas City. We didn’t need any more convincing. We decided to invite my brother Matthew along for the experience. Matthew was already familiar with Kansas City and had lived in the suburb of Grandview for the past 5 years or so, but he had surprisingly never been to Garozzo’s and was excited to try it out with us for the first time. I’ve always bought into Olive Garden’s idea that gathering around a dinner table to enjoy Italian food automatically makes you a family. Inviting someone from my actual family seemed fitting. Chad and I had skipped lunch in anticipation for tonight’s feast, and our hunger intensified the thrill we felt about this culmination of our experience with dating Kansas City. We all decided to order the Chicken Spiedini, of course. If a restaurant creates a famous unique dish, it is an unspoken rule that you have to try it on your first visit to that restaurant. Amazingly enough there were about five or six different ways to order and enjoy Chicken Spiedini. I took some notes, but mostly we talked a lot and laughed even more. Transitioning from local French restaurants to a local Italian restaurant brought a vast change in atmosphere. People were loud and lively and drinking their fair share of various wines! Our waitress brought refill after refill of bread and butter and this amazing shrimp scampi dipping sauce. At Garozzo’s there was no proper or polite French etiquette to be observed, but it was still classy and refined, in its own way. And this too, we loved. We were definitely going to be coming back here. Even though this was only the 3rd restaurant we would be enjoying before I sat down to write this paper about our experiences, we already felt like we had gotten a real sense of our new home. The community of Kansas City – being directly in the middle of the country – was used to warmly welcoming in people from various backgrounds and cultures. For someone like me – who has lived in eight different states and traveled to an even larger number of different cities – finding a place we enjoyed and where we felt we belonged was immensely refreshing. All my travels – however forced upon me as a child they were – have all been leading up to this time in my life. Kansas City seems to be the consummation of all my varied experiences, roaming across the country with an inconsistent upbringing. After all the different places I’ve lived, I don’t think I would have been content to put down roots in a city with only one type of people and culture. The “local flavor” of Kansas City is not restricted to simply one flavor – it is more a Baskin Robbins of the country. You never know where life will take you. I have come to realize that exploring your new place and becoming familiar with it will help you feel more and more at home. Moving to a new place is sometimes scary, but in this instance I had been preparing to call Kansas City my permanent home all my life. About a week later, I arranged a second date with Kansas City. Like anyone excited by such a great first date, I was eager to become even better acquainted with this new city I now called home. This time the date would be a Sunday brunch in historic downtown Parkville- the local restaurant of choice was Café Des Amis. After a seemingly never-ending winter, a light brunch at a fine French restaurant on a perfectly sunny 85 degree day felt like medicine for my soul. It was merely coincidental that we chose another French restaurant, but Kansas City was beginning to feel more and more like its nickname: The Paris of the Plains. We parked just a few yards away from where a large French flag was whipping happily in the wind, welcoming us. Once inside, we were seated by an authentically French man near the window overlooking downtown Parkville. The tables were draped with a clean black tablecloth placed cockeyed on top of a clean white tablecloth. Natural sunlight poured in through the tall windows illuminating the fully bloomed fresh red roses in the glass vases at each table. Overhead, French music filled the room with the soothing melodies of an accordion and mandolin. It was easy to pretend that we were not actually in Kansas City at all, but that we had somehow miraculously found ourselves transported to a small town in rural France on a Sunday afternoon. The Maitre d’ handed each of us a menu and brought us a basket of bread wrapped in a cloth napkin. Accompanying it was a square bronze dish with butter that was cut into two long obtuse triangles stacked neatly on top of each other. I commented to Chad how impressed I was with their attention to detail. As we pulled the cloth napkin apart to reveal the bread, steam arose with a heavenly scent that could only come from bread that was literally fresh from the oven. It tasted as glorious as it smelled. Chad and I both smiled at each other knowingly without having to say it out loud – we had just found a French diamond in the roughs of Kansas City. I decided to order the French toast. Everything on the menu was technically French, but it seemed fitting to me at the time to try something made at an actual French restaurant that is called “French” in everyday American household kitchens.Chadordered the Omelette Provencal. Neither of us was disappointed. My food arrived looking like a masterpiece of art crafted by Claude Monet himself! The French Toast was stacked around a ramekin of almond honey, with grapes split down the middle and paper-thin slices of apples neatly arranged around the edges and sprinkled with powdered sugar. This was not your mom’s French toast. I closed my eyes and breathed deeply as the first bite permeated every taste bud in my mouth. I looked at Chad and whispered to him excitedly, “Someone is making love inside of my mouth!”. Who knew Kansas City held at the center of its metropolis a small piece of paradise hidden away waiting to be discovered? Food may be fuel for the body, but exquisite food is nourishment for the soul. Getting to know our new home of Kansas City was now no longer a process so much as a pleasurable journey. We had quickly gone from a blind first date, to becoming much more intimately acquainted with our new home by the end of the second date. After that exquisite French toast, I felt proud to call Kansas City my new home and to commit to this relationship permanently. Tonight was the deadline for submitting papers to the 2012 English Honor’s Society Academic Convention in New Orleans. Some of the best books I have ever read have been personal true-life stories. Some of my favorite anthologies are filled with Personal Essays. My current favorite Personal Essayist is Anne Fadiman. If you haven’t read her book Ex Libris – you should. It made my world brighter. Most of the Personal Essays (hereafter referred to as “PE”) I have written have either been unknowingly (for it is my most natural writing style) or for a school assignment. The PE I submitted for the Convention just mentioned was for a school assignment that required us to do something we had never done before and then write about the experience. It was not supposed to be a review of something we had done. It had to fit within the parameters of a PE. At the time the assignment was given we had been living in Kansas City less than a year. We had ventured out some, but we didn’t really feel quite home yet. Someone in class threw out the idea of visiting local restaurants. You know, the kind that are not found anywhere else in the world except Kansas City. I knew immediately that was what I wanted to do, and through that experience I would begin to feel at home in Kansas City. Since I am an aspiring writer, I am going to post (in three parts) my PE for you to read here. I welcome all comments, but reserve the right to not publish some of them. Haha. that had been my faithful companions as I got lost in the pages of my latest book. Nevertheless, life was moving us forward, as it often does. At twenty-seven years old, this would be the first time I had ever had the chance to put down some roots. Like any first date, this starting out point can feel a little unnatural or awkward. Chad and I had found ourselves in an unfamiliar city we eagerly wanted to acquaint ourselves with. The natural instinct is to try and discover all there is to know until the blurred edges of the unknown become sharp and familiar. and for having more fountains than any other city except Rome, Italy. But these are just the outside persona of Kansas City. details that separate them from others; to know a place requires uncovering those same types of details, and I was determined to go deeper. the eclectic décor of local restaurants. The distinctive “local” flavor of a city is built upon the hard-working backs of the entrepreneurs that feed its sheep. I decided to set out on a journey to acquaint myself with Kansas City– to discover just how unique this city tastes. A first date with someone you are interested in is always accompanied by a heightened anticipation. For my husband and me, our first “date” with Kansas City was no different as we visited the local restaurant: Crepes on the Square. I felt like that girl getting ready for a blind date set up by her friends who didn’t know what to wear or what the evening would consist of. that exclusively calls its home the Kansas City Metro. other small locally owned shops. We chose a private table on the upper level of the restaurant where we could easily see everything. As I looked around, I saw several oversized comfy arm chairs and coffee tables perfectly suited for enjoying a cup of French-pressed coffee. This feature alone made me feel at home. The first thing that stood out to me besides the glorious scent of coffee meandering through the air was the décor. was hidden by antique doors of different styles and colors hinged together to form a wall of doors. For being a small, locally owned restaurant, Crepes on the Square had a lot to offer! The special of the day was the Reuben Crepe, but a Reuben has never been my cup of tea, so I continued to investigate the menu. At this point, Chad and I were just hungry enough that everything sounded delicious. I finally settled on the mysterious Monte Cristo crepe. inevitably played a role in my decision making process. the soft butter crackers sprinkled with rosemary that accompanied it.